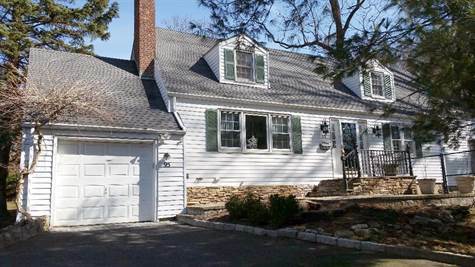 "Sought after Crest Neighborhood of Tarrytown"
Bedrooms: 4 "1 master plus 3 more bedrooms"
Bathrooms: 3 "3 fully updated bathrooms"
Basement: Yes, Full "storage & utilities"
Year Built: 1948 "Renovated 2015"
Beautifully updated 4 bed, 3 bath home w. attached 1 car garage in absolute move in condition. One of the larger homes in the sought after Crest neighborhood of Tarrytown. Spacious entry hall w. hardwood staircase leads through French glass doors to an over sized living room w. wood burning fireplace. Large opening to generous formal dining room. Short hallway to updated kitchen w. Stainless Steel appliances, granite counters & center island. Door out to side yard w. fenced in dog run. Kitchen opens up to breakfast area & sunken family room w. vaulted ceiling, wall of glass & door out to a sizable blue stone patio overlooking huge private backyard. Double doors to 1st floor bedroom & full bath. 2nd floor offers a large master suite w. WIC, dressing area & master bath. Two more large bedrooms & a full hall bath complete this level. Gleaming hardwood floors as seen. Large private & stunning backyard. Plenty of driveway parking. Laundry in full storage basement. Close to village & train. This well maintained home is much larger than it appears from outside... fresh paint throughout... refinished hardwood floors... all updated kitchen & bathrooms... new owners can join the Crest community pool & recreation for a yearly fee... close to all Tarrytown has to offer... taxes shown without STAR deduction... second fenced off backyard area is owned by the town of Tarrytown but is not accessible from any other property or road... therefore the owners of this home have exclusive use of it.